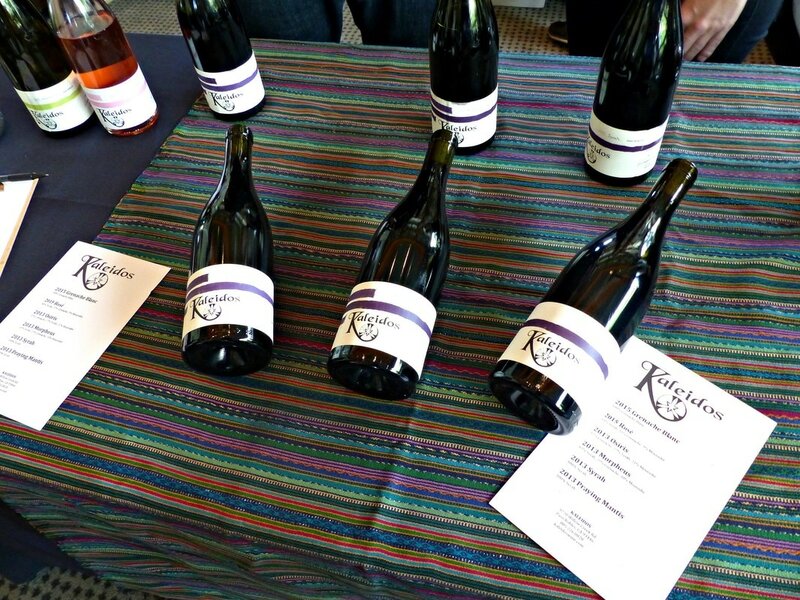 Popping corks on a fast growing wine trend, over 40 member wineries of the Rhone Rangers championed California’s terroir as a natural for France’s transplanted Rhône grape varietals in 2016 at their annual Los Angeles tasting event. Pouring and swirling at The Skirball Center, winemakers embraced the buzz, tantalizing wine lovers with their versions of France’s transplants. These fascinating wines embody some of the most exciting bottles produced in the state, and their growing popularity is taking what once was a maverick experiment and made it mainstream. ​So you may wonder, what is a Rhone wine? These wines, which originally came from France’s Northern and Southern Rhône regions, can include single varietal wines such as Syrah, Grenache (Blanc and Rouge), Roussanne, and Viognier; but the most fascinating wines are blends of several grapes, yielding a complex wine full of fruit and spice. Red Rhone wines can be a spicy Syrah, with dark fruit, peppery and meaty; or a classic blend of Grenache, Syrah, and Mourvedre (GSM), that thrills with a complex palate of fruit, earth, leather and spice. White Rhone wines can be an exotic Viognier, with a bouquet of apricots, pears, and tropical fruits; or a crisp, full bodied Grenache Blanc, with green apple, citrus, and white peach. These distinctive wines are perfect all season sippers, great with summer barbecue yet equally delicious with heavier winter food. 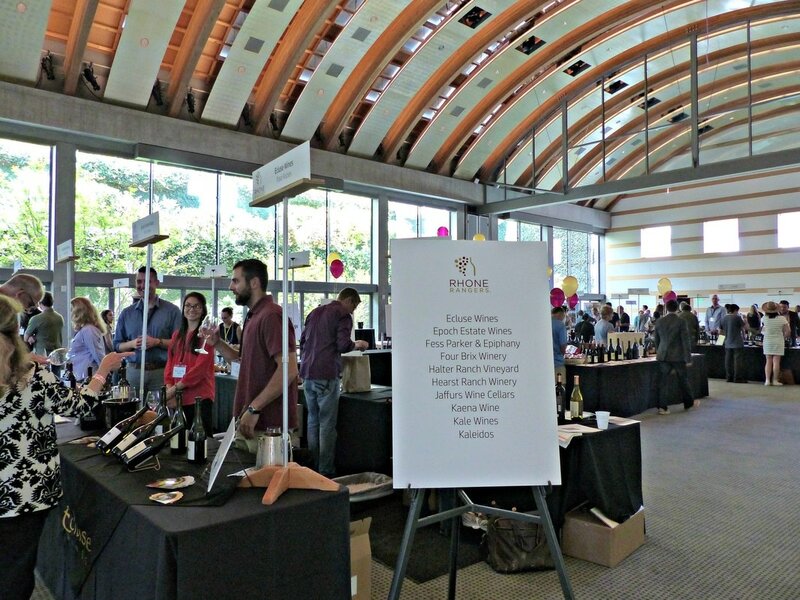 The Los Angeles Celebration of American Rhone Wines offered multiple ways for everyone to discover and enjoy the diversity of these wines. It was a full day of Rhone wine-centric activities, starting with a winemaker seminar, “Red and White Rhone Blends”, a panel discussion and tasting with seven of California’s hottest American Rhone winemakers: William Allen of Two Shepherds, Larry Schaffer of Tercero Wines, Jason Haas of Tablas Creek Vineyard, David Gates of Ridge Vineyards, Bob Lindquist of Qupé, Michael Larner of Larner Vineyard, and Kale Anderson of Kale Wines. Author Patrick Comiskey, whose book, “American Rhone: How Maverick Winemakers Changed the Way Americans Drink”, moderated the seminar, bringing his keen insights to the art of the blend. 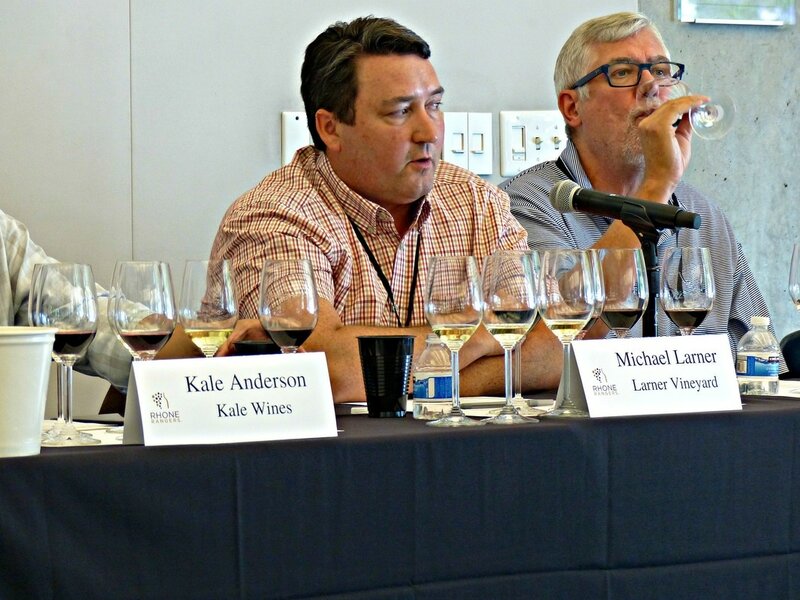 Comiskey noted, “California is all about the blend, and has a long history of varietal blending”, but advised that blending decisions are crucial to the success of the wine. 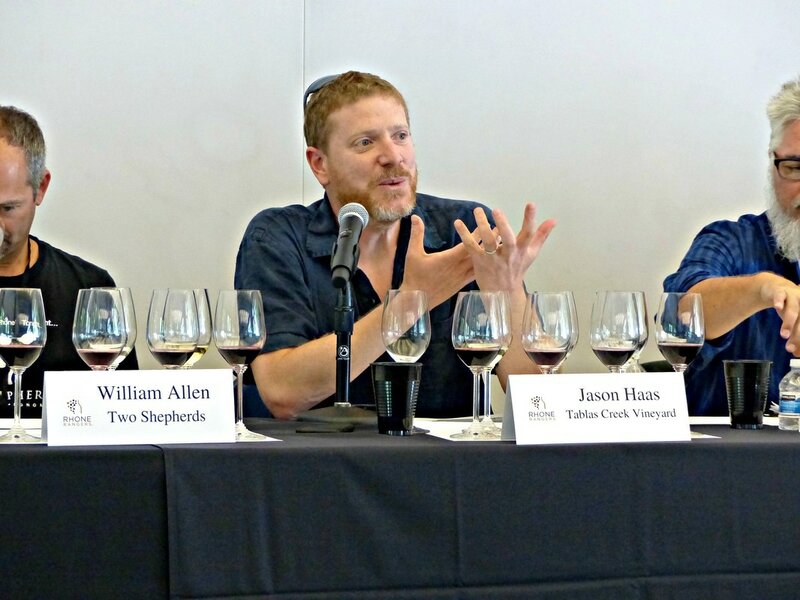 Each winemaker weighed in on their approach, adding a lively discussion to the value of experimentation, and the importance of the different varietals, exploring three white and four red wines. Anderson felt that his Heritage McGah Vineyard GSM wine was unique in Napa Valley, that co-fermentation brings complexity to the blend, and that rich fruit, balanced acidity and integrated tannins were the result. Larner dissected his Elemental GSM, finding that Syrah brings the flavor, Grenache adds acidity and alcohol, and Mourvedre is the garnish, with its nuances of game and pepper. 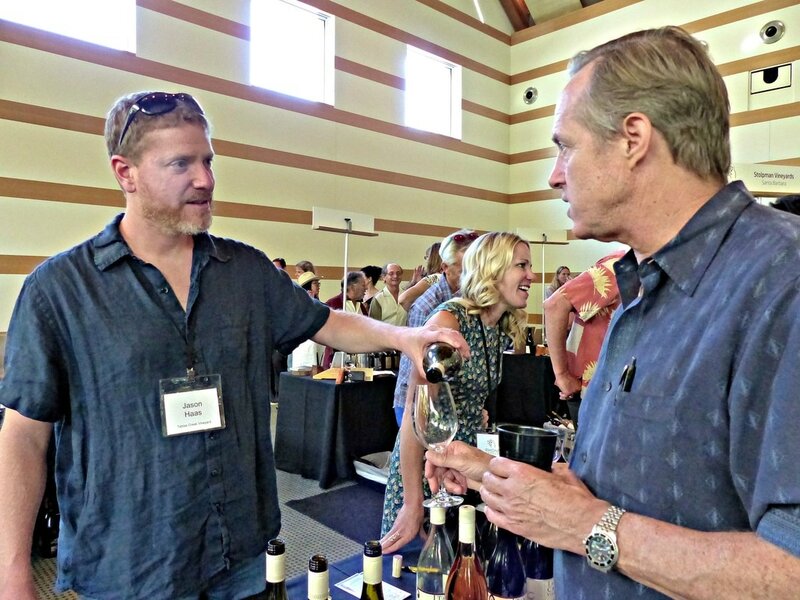 Lindquist, one of the early Rhone pioneers in California, pronounced that “the sum is larger than the parts”, that his Los Olivos Cuvée GSM’s “synergies in varietals play off each other in blending, and they need and compliment each other.” Gates felt that minimal handling was the key in crafting his Lytton Estate Syrah/Grenache blend, taking a page from French producers by co-fermenting his Syrah with some Viognier to give it deeper color and more flavor. ​When asked if they ever made a blend that didn’t work, some named specific blends that were never released, while others spoke in general terms. Anderson confessed out of 100 different blends, 99 didn’t work, admitting that he likes to blend at every stage of winemaking, and that for him, co-fermentation gave different results every time. 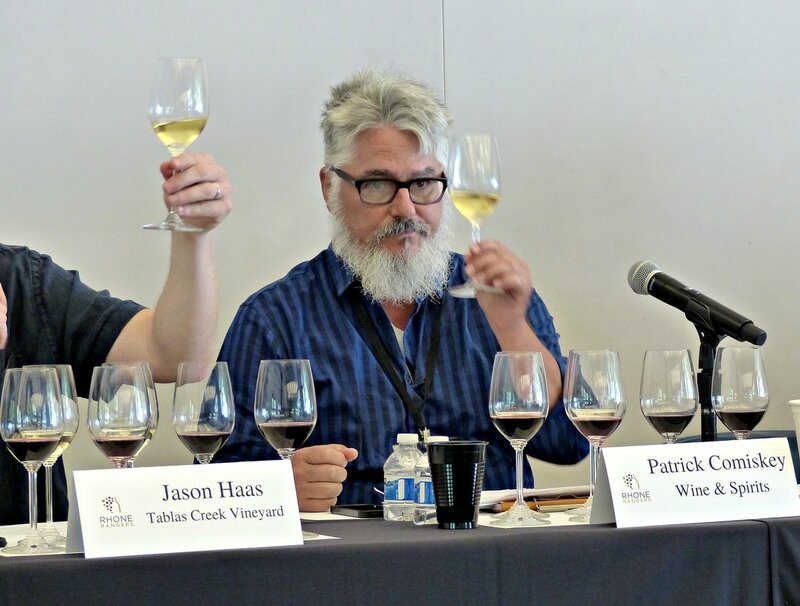 Haas felt it was in the timing of blending, preferring Spring after the wine has settled down from fermentation, and he noted that co-fermention has not worked for Tablas Creek either. Larner said he doesn’t make enough wine to experiment with, and sticks with the tried and true. 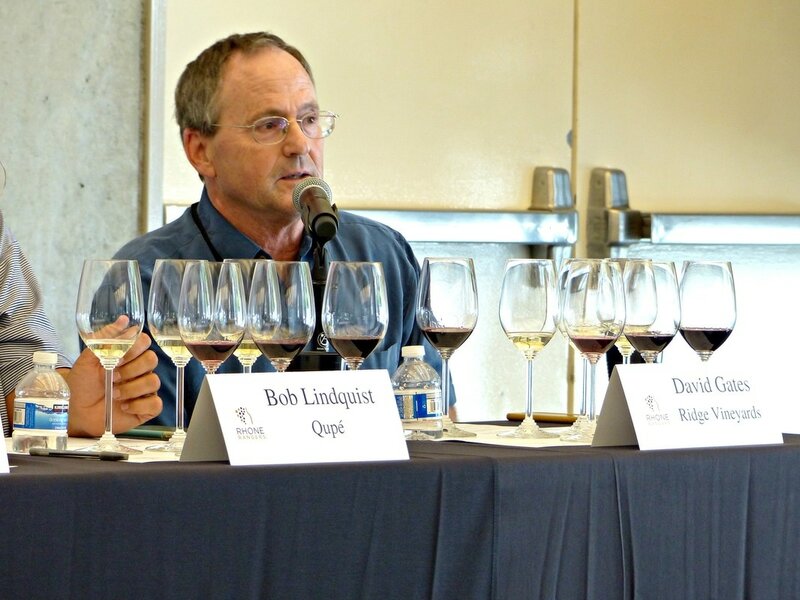 But Lindquist got a laugh, saying he never made a blend that didn’t work, since those blends that fell short were incorporated in Qupé’s Central Coast Syrah, what he called “the kitchen sink”. 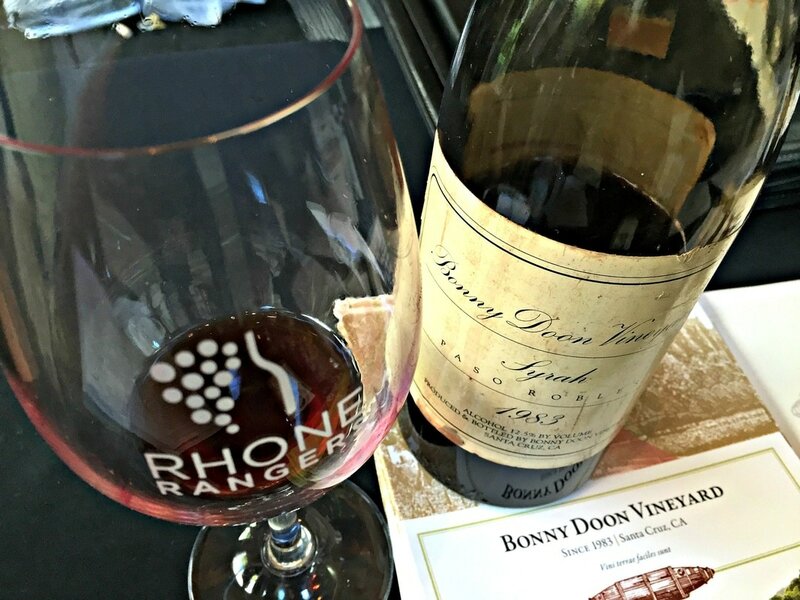 Boony Doon Vineyard, the iconic project of original Rhone Ranger proponent Randall Grahm, poured 10 very nice wines, all with screw caps! For over 30 years, Grahm has been an innovator, tinkering with matching vineyard sites to varietals. Achieving fame with his flagship wine, the legendary Le Cigare Volant, he’s expanded his “vin de terroir” to include Picpoul, Le Cigare Blanc (white blend), Vin Gris de Cigare (rosé blend), Clos de Gilroy Grenache, Old Telegram Mourvedre, and Bien Nacho X-Block Syrah, to name a few. All 10 wines that I sampled were excellent, most superb, wines of character and distinction. A couple of library wines were poured, and the very first vintage of Boony Doon, a 1983 Syrah, was offered as a novelty. Although over the hill, it was a kick to watch decanting by smartphone flashlight! Kaleidos Wine, out of Paso Robles, also poured over a half dozen beautiful wines, a Grenache Blanc, GSM Rosé, Osiris (GSM), Morpheus (SGM), Syrah, and an intense Praying Mantis Syrah. The horizontal stripes on the bottle labels correlate to the number and percentage of varietals in the wine, a visual aid to what you’re tasting! Winemaker Steve Martell is a purist, and his wines reflect the detail and care that goes into the bottle. 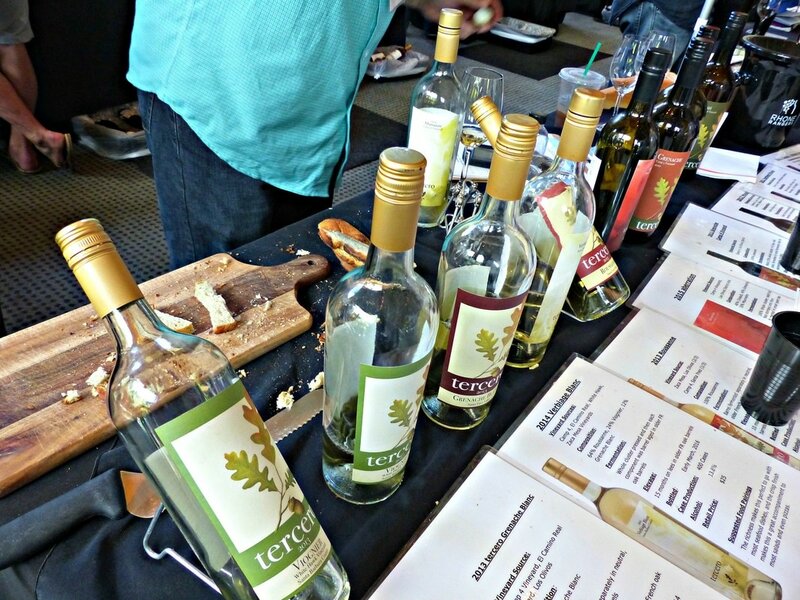 Tercero Wines offered almost a dozen delightful wines, red and white, poured with enthusiasm by winemaker Larry Schaffer. His Viognier and Roussanne, so delicious and distinctive; the White Hawk Syrah and Verbiage Rouge, standouts; but truly all the wines are special. 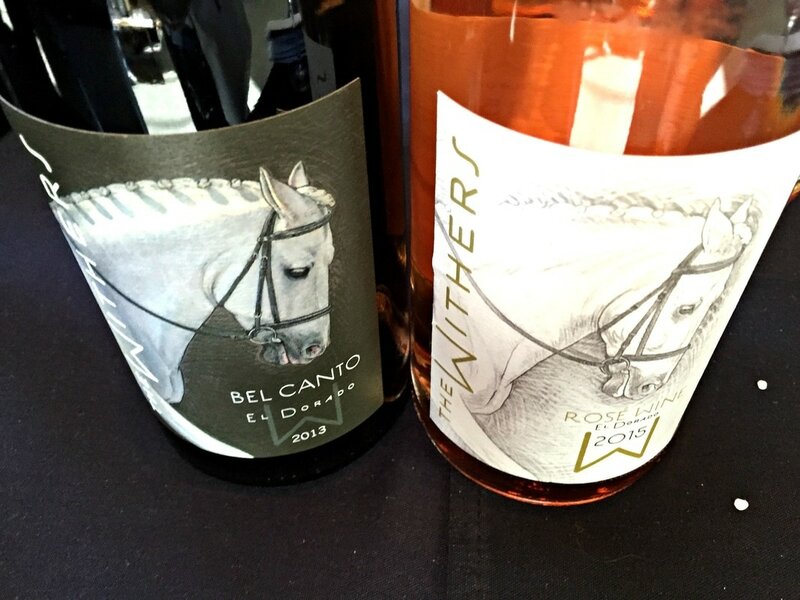 The Withers Winery poured four very good wines, a Rosé, Bel Canto Grenache Blend, Ruben Mourvedre Blend, and Mr. Burgess Syrah Blend, all from El Dorado. A relative newcomer, with 2013 The Withers first vintage, the commitment to quality is evident, and comes with a story. Andrew Tow, the founder, had been making wine for friends and family all his life. With Withers, he strives to take it to the next level, make great wine, sell it for a fair price, and give back to those in need, while being environmentally responsible. The labels, a tribute to Mr. Burgess, their beautiful Irish dressage horse, reflect the elegance in the bottle. Two Shepherds poured seven unique wines, a “Tribute to Saralee” Roussanne, Viognier, Pastoral Blanc blend, a Carignan Rosé and Red, Pastoral Rouge (GMS), and Cinsault from Bechthold Vineyard, the oldest Cinsault vineyard in the world. These distinctive, intriguing wines offer cool climate aromas and flavors with texture and mouthfeel, made in an Old World style with minimal intervention. Winemaker William Allen, a former garagiste, crafts small lot wines, most of which he sells to “The Flock”, his wine club. These are out-of-the-ordinary, fabulous wines that deserve a place in your wine cellar! 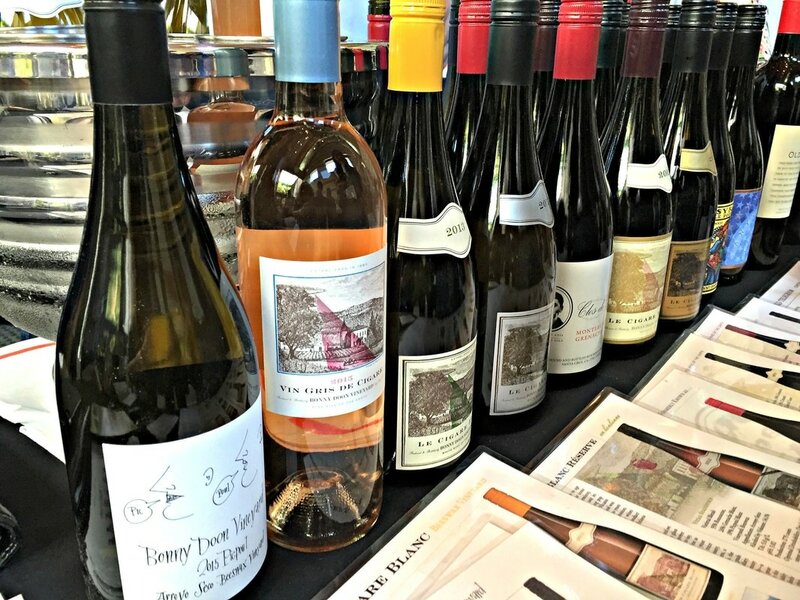 Proceeds from this tasting event and silent wine auction that followed went to the Rhone Rangers Scholarship Fund, which, in conjunction with the James Beard Foundation, grants a chef or sommelier a travel-study opportunity to learn about American Rhone wines.